According to a survey by LawnStarter, one in ten homeowners in the U.S. name pets as the biggest complaint they have about their neighbors. That’s over 12 million people! Are you and your dog contributing to this? If you think you are, maybe it’s time to be a good neighbor and get your pup under control! Here are the top four behaviors homeowners complain about, and how you can be a more conscientious dog owner. If your dog barks for extended periods of time, your neighbors are probably fed up of it—even if they’re too polite to say anything. There are a few ways to train your dog to break this bad habit. First of all, you can identify the source of the barking and limit their exposure to it. For example, if they bark at passersby, keep your curtains closed. Then you can start training. To do this, ignore her while she is barking—don’t face, speak to, or look at her. Attention will only reward the barking. Instead, give her praise and a treat when she quiets down—even for a moment. Teach her that bad things (no attention) happen when she barks, and good things (treats) happen when she stops. Another great technique is to teach her to speak. This sounds backward, but if you teach dogs to bark on command, you can progress more easily from there to a “quiet” command. Once established, you’ll be able to use the quiet command when she barks spontaneously. Keep your dog under control at all times by not allowing her to run around the neighborhood. 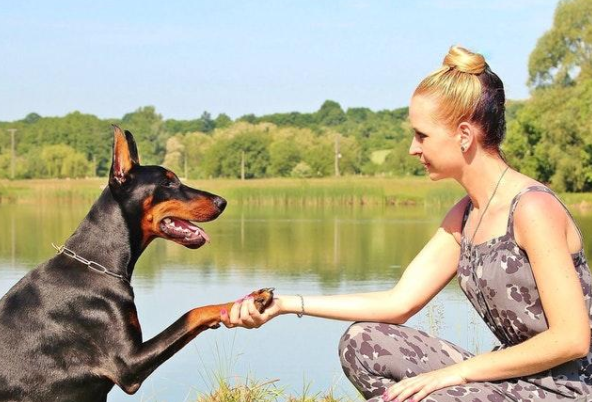 Even if you know your dog is friendly, many people may be scared of her. Also there may be children playing outdoors, who may not know how to safely interact with dogs. Check up on the leash laws in your area too. Some states allow dogs to be off a leash as long as they are accompanied; other states do not. In your garden, it is best to install a fence to stop your dog from running into your neighbors’ yards. Even if you presently have hedges separating your yard from your neighbors’ yards, your pup might find a hole or tunnel under it. According to HomeAdvisor, it costs between $1,646 and $3,932 to install a fence. This is a worthwhile price for the safety of your pup and neighbors. Your neighbors would be very strange indeed if they were not bothered by dog waste around their neighborhood and on their lawns. Countrywide, this is a big problem. Four million tons of dog waste are left uncollected each year, which causes 20-30 percent of all pollution in waterways. It’s also a health hazard to people, especially children. Don’t be a part of this problem. Take biodegradable bags with you when you take your dog out, pick up any waste, and dispose of it. If dog waste is a larger problem in your neighborhood, you could try talking to other dog owners or your local homeowners association about getting dog waste stations installed. If your neighbors see you out with an untrained dog—ignoring your commands, dragging you around, or generally being out of control—it will make them nervous. This is especially so if they have children, as they may be concerned about your dog becoming aggressive around them. Going to doggy training classes is a surefire way to keep your neighbors happy. Your dog will learn commands that will help keep her under control when out and about, which will be crucial if she ever gets off her leash. She’ll also learn to stay calm in hectic environments, surrounded by lots of other people and dogs. This is important if there are a lot of other dog owners in the neighborhood. Your dog may be your best friend, but your neighbor may not hold her in the same regard. However, this doesn’t have to be the case! With a little effort and training, your furry friend can become an upstanding member of the community.